Newton's Nook Designs: Inky Paws Challenge #29- WINNERS! Inky Paws Challenge #29 Winners! 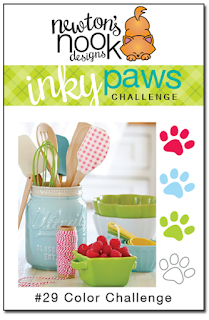 Thanks so much to everyone who entered our last Inky Paws Challenge at here at the Newton's Nook Designs blog! This months Challenge was a COLOR THEME! It seems like everyone had a ton of fun with our colors this month! THANK YOU to everyone who entered! All the awesome entries always make it difficult to choose the winners! Announcing.... our top picks! Read the description below each card to see who created it - and make sure to visit their blogs and tell them congrats!! Our first top pick is this adorable card is by Dawn E! We love how she used the color combo to color that stack of blankets for the kitty image from the Newton's Naptime stamp set! 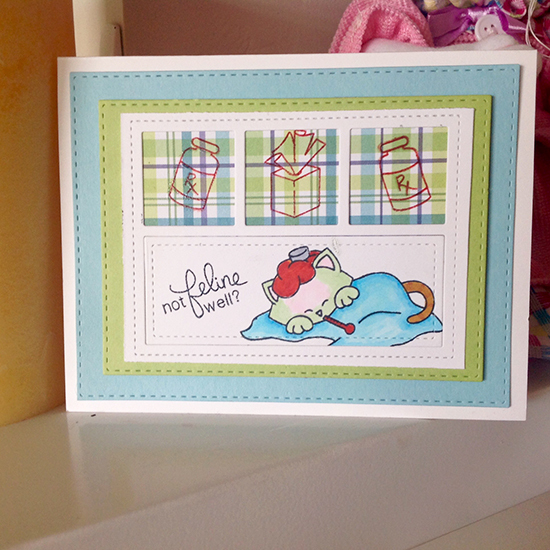 Our second top pick is this sweet spring card by Vicki! Winston is so cute with his garden of flowers to water. I love how she used the colors too with just a pop of red! She used our Garden Whimsy stamp set to create this card! Congrats to Dawn and Vicki! Don't forget to send us an e-mail at info@newtonsnookdesigns.com to claim your $10 store credit and get your winner badge for your blog! Since there were so many great cards with this sketch cards, we chose THREE more as our favorite picks! If you see your card below, contact us if you'd like to get a "favorite" badge for your blog! This Get Well card by Mary Gable made us smile! I love how poor Newton is a little bit "green" in the face! Hope he's feeling better now!! Those cute images are from the Newton's Sick Day stamp set! This card by Barbara is so sweet. We loved how she used the color combo on the blankets and card base with just a pop of red on the hearts! She also used our fun Newton's Naptime stamp set. And one more favorite - We loved the way Lindsey created a fun scene using the color combo! Such an adorable card! 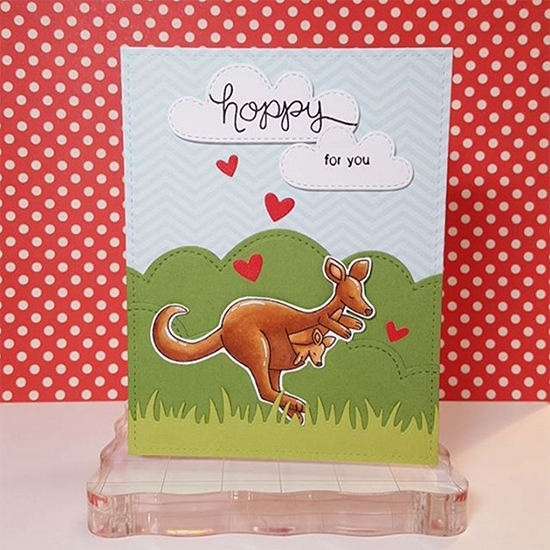 She used our Hoppy Days Stamp Set for the cute kangaroos and sentiment! Thanks again to everyone who entered - It's really so much fun to look through all the entries and see everyones ideas! If you didn't win this time we hope you'll play along again next time! 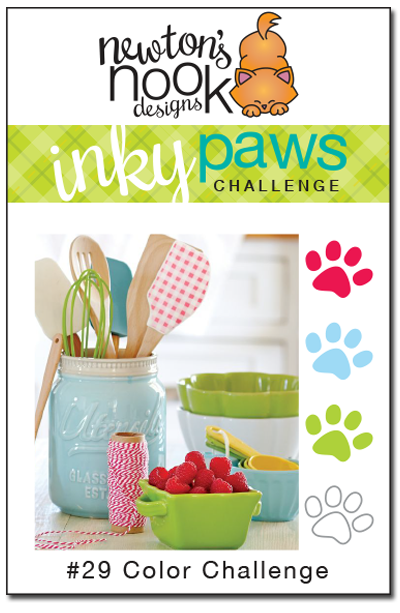 Our next Inky Paws challenge will begin in a couple weeks - on Friday, March 25th! AWE!! Thanks so much for picking me as a top card! I am completely honored and will be sending out an e-mail shortly!! :) Thank you!! Thanks for picking my card as a top pick! You guys rock! Congrats to all the winners! Great cards!!! Congrats to the winners and those featured! Everyone's cards are amazing! Thank you so much for picking my card as a favorite! You can't believe how excited I am and how much this inspires me to do more. Can't wait til the new challenge. Thanks so very much for picking my card. I loved making it and just today noticed that it was picked.